A memo for the purchase of the vehicle emanated from the Political and Economic Department of the Governor’s Office through the Office of the Secretary to the State Government (SSG). The letter authorizing the purchase of the SUV was addressed to the SSG, Dr. Modupe Alade. It was written by Mr. Bayo Opeyemi, the Executive Secretary/Director General, and was dated August 1. The deal was alleged approved same day by Fayose with his signature on the document. A Certificate of No Objection (CONO) for Contract Award for the procurement of the SUV was also issued by Ekiti State Bureau of Public Procurement, dated August 3. A Certificate of Purchase (COP) was also issued. A civil servant familiar with the deal said: “The question people should be asking is: why is the outgoing governor approving the parting gift for himself? “It is strange in the system, unheard of; it is suspicious. It was supposed to be the decision of the government and not the decision of one man. Former Minister of State for Works, Prince Dayo Adeyeye, slammed Fayose for allegedly buying the SUV as a parting gift. He criticised the payment of N43 million severance package to himself and deputy, Prof. Kolapo Olusola. Adeyeye also criticised the governor for alleged sale of government property and auction of government vehicles to cronies at “ridiculous prices”. 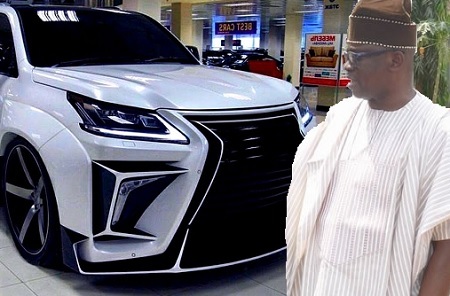 The Chief Press Secretary to Ekiti State Governor, Mr. Idowu Adelusi, has debunked the alleged purchase of a N75 million Lexus “parting gift” to the governor from government coffers. In a text message to our reporter last night, Adelusi challenged anyone with evidence of the purchase to present same. The governor’s aide urged anyone with evidence that Fayose paid N43 million as severance package to himself and his deputy, Prof. Kolapo Olusola, to show it. He described those criticising the purchase of the vehicle as “ignorant”. Adelusi said: “Those who alleged should come forward with genuine evidence of purchase of the vehicle as well as payment of severance allowance.